Record attendance of almost 400 people marked the 26th annual spring training conference on March 4 & 5, at the Ramada Plaza Hotel. Class highlights included a presentation on EAB, updates on pollinators and national legislation of chemical applications/products that may be soon affected by their reduced numbers; human chemical sensitivities and treatments by Dr. Ken Gerdes, and survey results on cleaning out spray tanks. Click here for the list of STC Exhibitors and contact information. 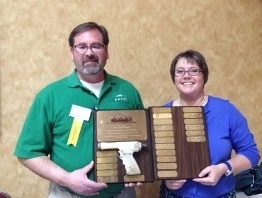 Laura Pottorff 2014 Golden Gun RecipientLaura Pottorff was recognized by Tom Lynch, President of CALCP, for her many years of quality service to the Green Industry at the CALCP Spring Training Conference on Tuesday, March 4 at the Ramada Plaza Hotel, Northglenn. She graduated with a BS in Plant Pathology in 1985 and an MS in 1988 both from Colorado State University. She worked for a couple years at the Oklahoma State Univ. Cooperative Extension and from 1990 to 2001 in the Jefferson County Extension Plant Diagnostic Clinic which she ran for several years. From 2001 to 2007 she was the regional Greenhouse specialist for CSU Cooperative Extension in Adams County and then moved to be the Pesticide Applicator Program Manager for CDA from 2007-2009. In 2009 to the present she has been the Nursery, Seed, Phytosanitary, Greenhouse program manager for CDA. She is currently coordinating statewide efforts with the Emerald Ash Borer invasion. Thanks Laura for all you do for the green industry.